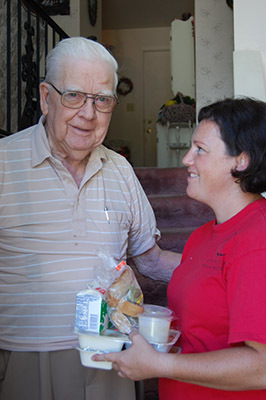 Meals on Wheels helps seniors remain in their own homes by providing hot lunchtime meals for those age 60+. We provide a safety check for our seniors, giving peace-of-mind to family members who must work during the day. If in the unlikely event a senior needs immediate medical assistance, drivers and volunteers will call 911 and remain with the senior until help arrives. 60 years of age or older and homebound, and the caregiver spouse of the homebound senior, and the disabled child of a homebound senior. Homebound is someone that is unable to leave their home without assistance. Those individuals who still drive and get out into the community are not considered homebound. Meals on Wheels encourages those that are not homebound to participate in lunch at their senior center. Prior to beginning Meals on Wheels, a staff member will visit the senior's home to assess their needs and make a final determination for eligibility. A waiting period for services may apply due to insufficient funding or delivery capacity. Service levels will depend on the ability of the older individual to help themselves, and the capacities of family members and caregivers in and out of the home to provide assistance. Meals are served Monday-Friday, excluding holidays. The number of delivery days is dependent upon need. Special diets are available for those at higher nutritional risk. Fees are not charged for this program. Office Hours – Monday-Thursday 7:30 a.m. – 5:30 p.m.
Office Hours– Monday- Friday 8:30 a.m. - 4 p.m.